Since 1998 a European Family Congress has taken place approximately every six years in Schoenstatt with families from every country in which there is a Schoenstatt Family Movement. In 2010 families from 18 countries in Europe with 14 different languages took part. The 2004 Congress gave rise to the “Europe Forum”, an annual meeting of delegates of the Schoenstatt Family Movement from the various countries in Europe. 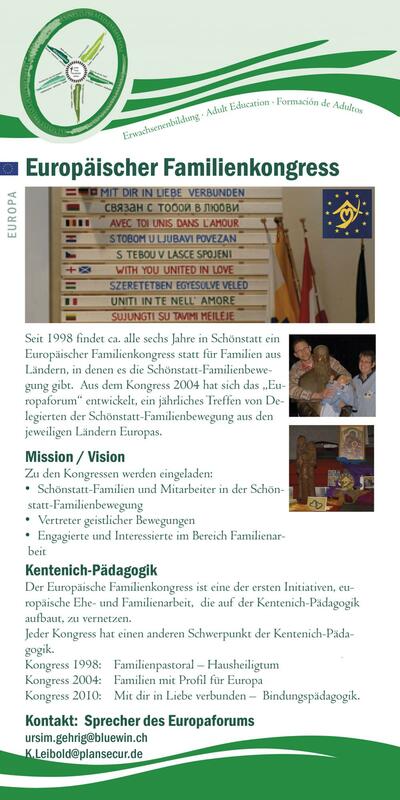 People involved in working with families Kentenich Pedagogy The European Family Congress is one of the first initiatives based on Kentenich‘s pedagogy to create a network for those working in the field of marriage and the family.